Under the direction of Chief and Council, the Canim Lake Band operates over 100 various programs through education, training, administration, capital, operation & maintenance, treaty & self-government, forestry, capital, health, social development, lands & membership, wellness program, finance, and housing. The People of Canim Lake Band, or the Tsq'escenemc as we are known in our native language, Secwepemcstin or Shuswap, are members of the Shuswap Nation. Canoe Creek Band is made up of two communities, Dog Creek where the administration office is located and Canoe Creek. Both communities are located in a semi remote area southwest of Williams Lake on the east side of the Fraser River. There is a health station in each community. In Dog Creek, as well as the Band administration office, there is a treaty and natural resources office, a community store with gas pumps and a post office and the Band’s development corporation: Stswecem’c Xatl’tem Development Corporation. The Band recently purchased a small ranch at Meadow Lake. The band population includes over 700 members, with less than 50% living on the reserve. Many members live off for a number of reasons. Because of the communities remoteness, members have to go elsewhere for work and for post secondary education. There is also a shortage of housing, as well as jobs. The community of Dog Creek has seen two major mud slides, the most recent being in the 1940s and one some time before that. Because of this the ground is considered unsuitable for housing construction. The community of Canoe Creek on the other hand has stable ground but lacks good domestic water. To date there are 55 houses in the community, with close to 20 of those needing replacement in the next 5-10 years and 15 families on the waiting list. The band builds its own houses under the Canada Mortgage Housing Corporation program. Band members have their own businesses, such as cabinet making, Silviculture, vegetable gardening, operating a small sawmill, electrical wiring, beef cattle operations, hay production and catering and bread-making. In the plans are a log house building business and an expanded agricultural program. 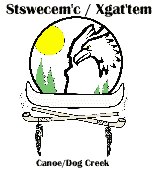 Esk'etemc is a Secwepemctsin speaking group. Esk'etemc has 19 reserves situated on the Fraser River southwest of Williams Lake, with an approximate total area of 3,800 hectares. Esk'etemc's administrative offices and the majority of the population are located on IR#1 (Esk'et) about 50 kilometres from Williams Lake on the east side of the Fraser River at Alkali Lake. The current Esk'etemc population is 809 members, with 384 members on-reserve and 349 off-reserve. Esk'et reserve has its own fire hall, store, gas station, motel, radio station, and a facility from which Esk'etemc controls and administers health and justice programs. Treaty. In 1994, Esk'etemc signed into the treaty process and is now in stage 4 - the Agreement-In-Principle stage - and has released 11 chapters to the public. Sport and recreation. Two ice hockey rinks are maintained by volunteers throughout the winter and summer months, a baseball and soccer field are available through the school, and a Pow Wow arbour is located on one of our reserves, where the Esk'etemc Annual AA Round Up is held every year. Esk'etemc members are employed in the forestry and ranching sectors, and entrepreneurs operate contracting and catering businesses. Esk'etemc runs Ecolink which conducts silviculture work and during peak season employs about 70 people, approximately 90% of who are Aboriginal. Timber tenures are managed on behalf of Esk'etemc by Alkali Resource Management Limited which is owned by Esk'etemc. In addition, Esk'etemc has skilled construction companies which operate on the reserve. The Esk'etemc people have assisted in accommodation of the making of three movies, including our own "Honour of All", filmed in 1985 on Esk'etemc reserves; "The Thirteenth Warrior" staring Antonio Banderas, filmed along the historic Fraser River in 1997; and "The Thaw", starring Val Kilmer and filmed near Little Dog in 2009. Education. The Esk'etemc-operated Sxoxomic School offers Kindergarten to Grade 7. After Grade 7, students attend high school in Williams Lake. The Esk'etemc also operates a Head Start/Day Care program which offers children age 0-6 years an education program for preparation into the school system. A growing number of students are attending post secondary courses. In 2001 the Soda Creek Indian Band decided that the best way to operate its commercial enterprises was through a limited partnership consisting of an incorporated general partner (Xat'súll General Partner Ltd.), which operates businesses, and with a limited partner (which is the current Chief & Council). Xat'sull currently operates two social enterprises, Xats'ull Heritage Village and Whispering Willows Campsite. Xat'sull is also in the process of planting a community garden for the 2008 Season. Xats'ull Heritage Village is a site that brings ancient traditions to life, and brings both elders and youth to revive the Shuswap culture of the Xat'sull community, and share it with the world. Whispering Willows Campsite is a campsite that caterers to campers and RV'ers alike. Both sites are available for rental. A community garden was established because of the interest to address the shortage of fresh foods in the community. The Education Department is responsible for the administration of education programming and funding from Kindergarten to Post Secondary. This includes liaison with the local school district in regards to the educational needs of our elementary and secondary students. In addition, the post secondary students have their living allowance and tuition fees administered through the Soda Creek Education Department. The T'exelcemc (Williams Lake Band people) are members of the Secwepemc Nation (Shuswap people). 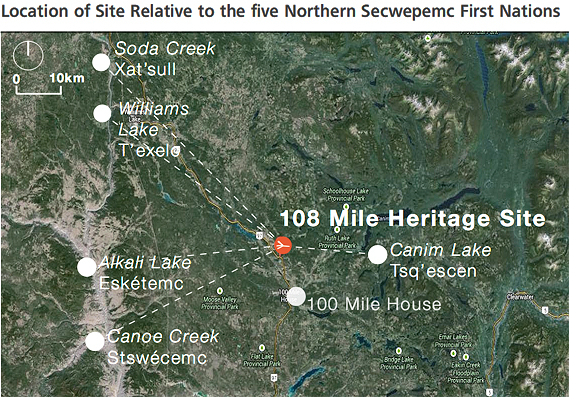 Secwepemc lands extend from Shuswap Lake in the south to Quesnel Lake in the north, and from Columbia-Kootenay Range in the east to Alexis Creek Area in the west. We know, and archaeology has shown, that Northern Secwepemc culture stretches back for 4000 years in the Cariboo Region. For thousands of years we lived in semi-permanent villages in the winter and moved around on the land in the summer to collect fish, game and plant resources. We enjoyed a rich environment and a rich ceremonial life. Our chiefs led a strong people. They do so today. Today we have 469 band members and our population is growing. 188 members currently live on reserve, 281 live off reserve. Our band members include teachers, lawyers, social workers, artists, loggers, ranchers, and entrepreneurs. We honour our Elders and treasure our children. Our families are deeply important to us. We value our past and look towards our future. Many band members operate home businesses. Some sell arts and crafts (leatherwork, basketry, and beadwork), while others offer catering (including providing traditional foods such as bannock, wind-dried salmon, deer meat, canned preserves and berry desserts). There are also private entrepreneurs in the community, including ranchers, farriers, tradespeople, administrators, silviculture technicians, logging contractors and casket makers.